As a result of the most recent round of elections, the Minneapolis Parks and Recreation Board received six fresh, progressive faces on its board of commissioners, including District 3 Commissioner Abdikadir “AK” Hassan. Not only is Hassan one of the six newly elected commissioners, at 27 years old he is also the youngest commissioner and the first Somali American vice president in the board’s 130-year history. 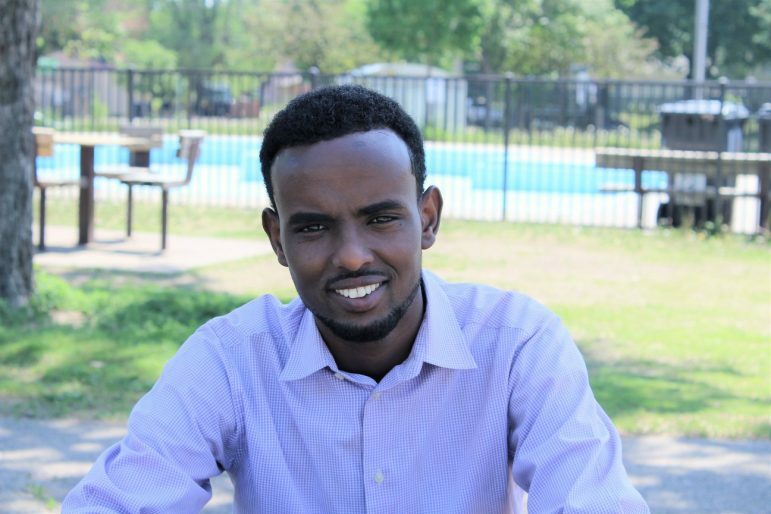 In 2009, Hassan joined a project called “Save Peavey Park,” which educated him on the parks system, but it wasn’t until 2011 when he participated in Minnesota Youth in Government that he saw a career in politics for himself. Now, in addition to his park board responsibilities, he is the president of his Ventura Village Neighborhood Association and the Chair of the DFL Somali-American Caucus. “At one point I was the citizen complaining. Now that I am in this position, it’s time for me to fix it, so that’s the challenge I am facing,” Hassan said. Growing up just blocks away from Peavey Park, Hassan recalls spending his childhood playing soccer in the parks and forming a great appreciation for them. But, he said he also knows that the parks have historically not been equitable for everyone, a concern that was at the core of his campaign. While sitting in Peavey Park, he points to the swimming pool and uses it as an example. “Not only is the swimming pool not full,” he said, “but it’s not even one of the new ones that some of the other parks are getting.” To him, this is an example of the historical problem of the parks allocating resources in an inequitable way. While Hassan plans to approach all issues and tasks with a fair mindset, he said one of the most effective ways to make the parks equitable is through drafting an equitable budget. “The budget that we are in right now has been set up by previous commissioners, so it’s a challenge to work forward,” he said. Along with drafting a new budget, the board is also looking to hire a new parks superintendent. They recently voted unanimously to hire the St. Louis Park-based company kpCompanies to carry out the national search. According to the Star Tribune, the board has allocated $80,000 to $100,000 to cover all costs like airfares and community engagement sessions. Looking to the future, Hassan said, “I think we are going in the right direction, but things don’t come easy. We are going to have some challenges ahead, and we are going to have good times ahead of us. We just have to prepare. Very well said and I agree.